Castle Rock Community Club: Yogurtland Fundraiser Next Wednesday! 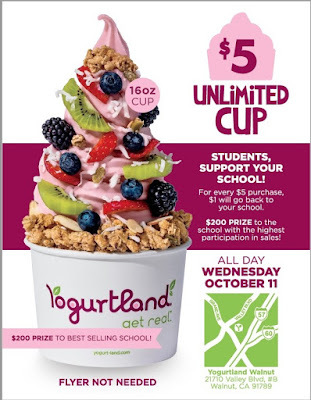 Yogurtland Walnut will be hosting a fundraiser all day next Wednesday, October 11th. Flyer is NOT needed. Just mention Castle Rock Elementary School at check out, and $1 of every $5 of your purchase will go to our school! In addition, a $200 prize will be awarded to the school with the highest participation in sales, so get your froyo on, Knights!